Don’t have a place to cut a real tree, Don’t have a place to store an artificial tree, Need a little decorating on your front porch? Well here’s the solution…. Do a no cost decorating tip by using what you already have hanging around. I grabbed an old painters ladder, wrapped a strand of lights and burlap strips around it, and added a festive bow. I placed it on the front porch and at night when it’s plugged in it looks just like a traditional pine Christmas tree. You don’t have to spend a lot of money with your decorating. For me I enjoy keeping it simple just as much as I do going all out with my decor. Use what you have and you’ll enjoy it too! Oh Dawn this is fantastic. Could not look cuter in your cabin. Thats a cool idea Dawn! Very cute….esp with your cabin! That looks so cool! I love the idea of using your ladder.Love the big bulbs too. 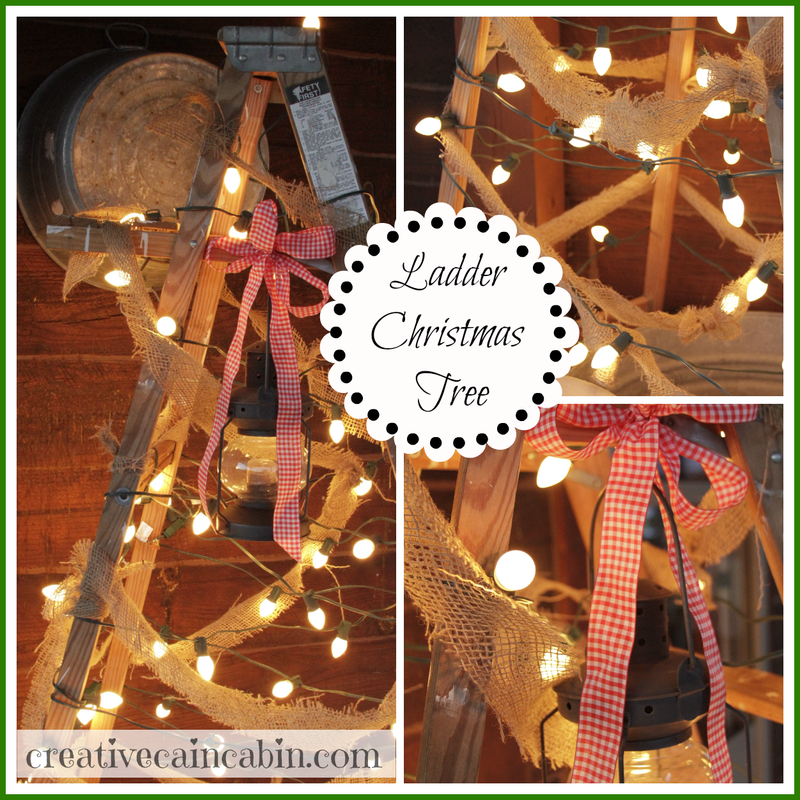 Dawn what a fun idea,this is fantastic.Love the use of the old ladder and lights,I know it shapes up just like a Christmas tree…fabulous my friend! I’ll be parting with ya Monday night! I’ve just about thru with the deco. It looks great Dawn! You are so creative. I love the big, old-school lights on it too. This is such a cute idea. A ladder is a creative way to decorate. I have a link party called Wednesdays Adorned From Above Blog Hop and would love to have you share this with everyone. It runs from Wednesday through midnight Sunday. Here is the link to the party. Talk about thinking outside the box…this is fabulous. I love the big lights too…awesome inspiration! See you for your party tomorrow. Well! Aren’t you creative! 🙂 I would like to see a picture from a distance. The close ups are beautiful! You sure know how to make a ladder look good! That is so darn clever of you and would fit in perfectly on your front porch. Because our neighborhood was built on an old farm, the “powers that be” decided to use some windmills (new but made to look old) at the entrances to our neighborhood. At Christmas time they put white lights all over & they are so pretty. A few people around the neighborhood have small replicas of windmills, and I could definitely go for one of those. We all have a windmill icon on our house numbers, and the windmill icon is the official emblem for all of our HOA info. Sorry for carrying, but your ladder reminded me of our windmills! I use an old ladder in the spring and summer for a plant stand outside in the garden. Now I can use it in the winter too. Great idea. Love it! I sure wish my husband had listened to me when I told him not to throw our old ladder away. I bet it does look like a tree from a distance. This is fantastic.I love the look of the ladder with the lights on it. So cute! What a great idea! Love the rustic look of it with all the twinkle lights! So pretty! Sweet! Thanks! That is one where I am going to look for the best ladder, a great old wood one….. Visiting from the WOW party…you had me at the ladder! Now how adorable is this project? What a staement and it looks so perfectly rustic in your home. Where did you ever find a wood ladder? Visiting from Homespun Holidays over at Cedar Hill Ranch. Have a wonderful weekend!!! Love it!! Great rustice/farmhouse look…love the bigger old fashion lights too! That is an awesome idea….hmmm….I need a paint ladder 🙂 Thank you for sharing this at Rustic Restorations Weekend. That is so much fun Dawn! I love it!